For the past couple weeks, our efforts have focused on catching juvenile fence lizards. Chris is looking at survival rates, morphology, and behavior of these little guys in response to fire ants (as we did with adult fence lizards earlier in the summer). Some lizards will be in fire ant enclosures and some lizards will be in fire ant-free enclosures. 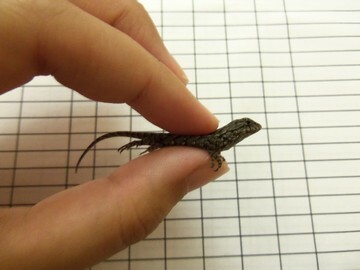 Catching juvenile lizards is a lot different than catching the adult lizards. At first when Chris told me we were going to be hand-catching all of them (all 48 of them), I thought he was kidding. He was not. The fishing pole/noose combination does not work very well for these little lizards so you need to catch them by hand. Luckily, they don’t tend to climb high up on trees so me being 5ft 4in wasn’t an issue in most cases. Juvenile fence lizards tend to be located closer to the ground on cover objects like wooden pallets, tree branches, woodpiles, and tree stumps. We typically worked together to catch the lizards because they are small, fast, and easy to lose track of when they run around. The two sites where we caught these juvenile fence lizards are considered “fire ant invaded sites” as there are fire ants coexisting with the lizards. In a few weeks, Chris will be traveling to Tennessee (where there are no fire ants) and will be catching juvenile fence lizards at two more sites. Categories: Summer 2012 Field Trip | Tags: by Jill, enclosures, fence lizards, field trip | Permalink. July marks the fourth month that I have been on co-op with the Langkilde Lab. It’s hard to believe that it’s gone by this fast! It seems like just yesterday I was working with Lindsey, Jenny, and Brad (PhD candidates who work in PA) on their wood frog projects back in Pennsylvania. It’s been a lot of fun so far and I expect the last month and a half to be no different.